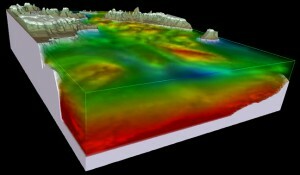 Salinity Distributions in the Chukchi Sea in Fall 1990 viewed from the Northwest. Vertical Exaggeration is 250 above water and 2500 below water. The complacency with 2D surficial modeling is likely a natural byproduct of human life on the surface of our planet. However, once we delve into life in the oceans we must acknowledge that all life exists in a truly volumetric world. Understanding life within the seas requires an understanding of the volumetric properties of the water bodies.